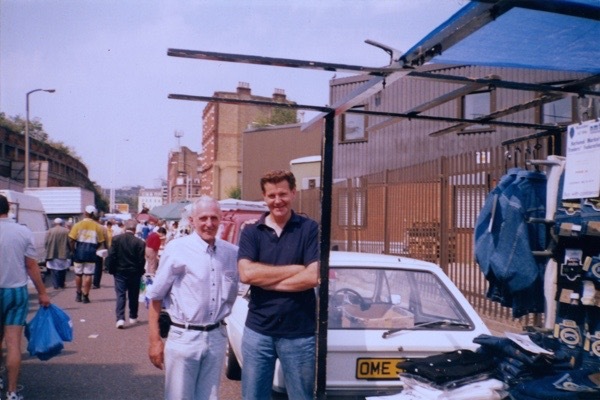 Robert Green - My connection to the Sclater St Market goes right back to my father’s father, Edward Green, who started down here in the twenties. He used to sell bird seed. In those days, it was a big animal market and pigeons were the number one thing. Every man in the East End used to levitate his way down towards Club Row, as it was known then. So my grandfather ended up down here selling bird seed on a regular basis and, as soon as he was old enough, Ronald, my father – who was born in 1921 – started coming down here with him too. My grandfather was in the Coldstream Guards. He got wounded and sent to the military hospital at Woolwich. After he came out of there, he began trading down the market on Sundays. In the thirties, my father started thinking about market trading himself but he did not join the animal market, he decided to go into clothing – which we are still doing today, selling a few socks and things like. He traded all through the war and I remember him telling me about the first time they had an air raid siren – he said he had never seen the market pack up so fast, everyone was gone in about ten minutes. After the war, a lot of buildings had gone. That plot behind my stall where the ‘Avant Garde’ Tower is now was one big wasteland. A lot of people set up stalls on that piece of ground. The owners of the properties had not got any war damage compensation, so no one really planned to do anything. It was just left as wasteland and people started trading there, which was how my father ended up on a bomb site. He traded there from 1948 until the mid-fifties, which is when we got the licence in the market. 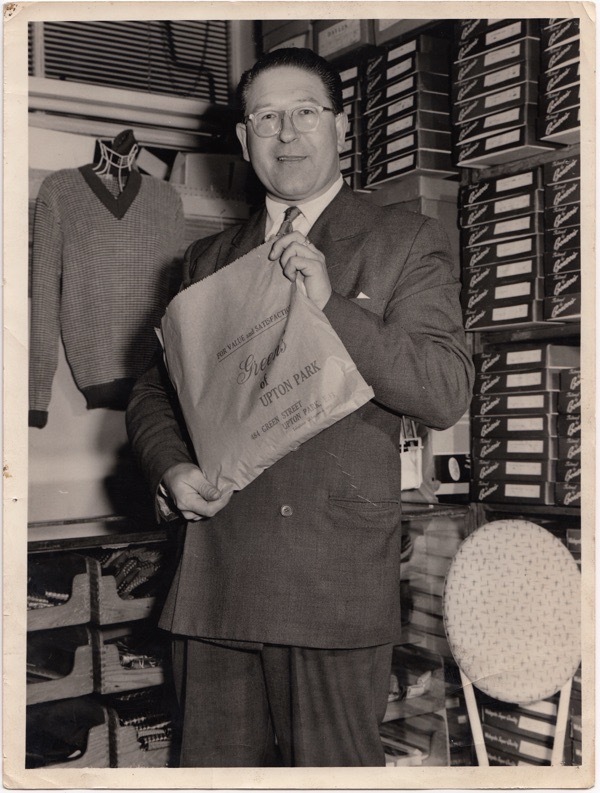 He had been applying for the licence all that time while he was working in a menswear shop in Green St during the week and trading on Sundays, until he got prosecuted for illegal trading– a five pound fine and ten shillings cost. Finally in 1955 – just before I was born – he managed to get a licence. A pitch became available and the council offered him a permanent licence, so he took that. The Gentle Author - Why did it take so long to get a licence? Robert Green – You simply could not get a licence in those days, it was such a busy market that there was literally no space. All the pitches were taken. Nowadays it is easy to forget, but relatively recently – from pre-war days up to the fifties, even the early seventies – on a Sunday, you go could down your local high street and hear a pin drop. There was nothing open. If you wanted to go anywhere and do any shopping or look around, the only place to go on a Sunday morning was down the market. 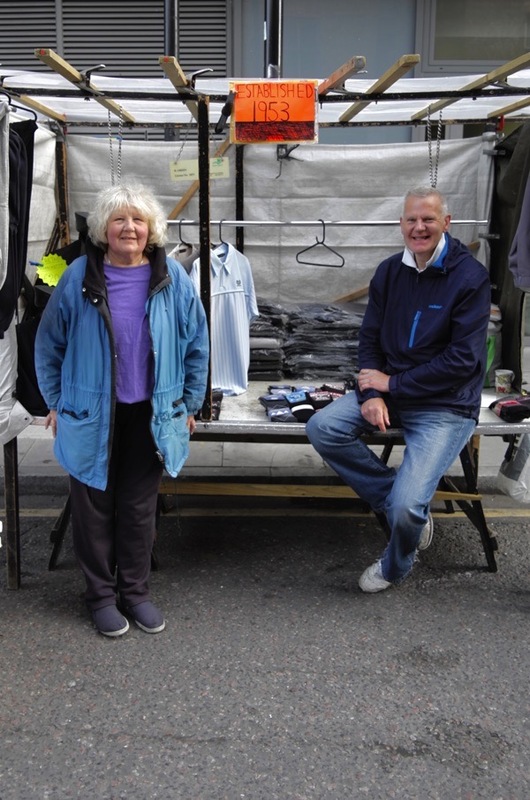 In Tower Hamlets, on Sunday there was Petticoat Lane, Club Row and Columbia Rd. Virtually all the men in the local area used to make their way towards Club Row Market because it was the place to be on a Sunday morning. It was always known as a local market, whereas Petticoat Lane was a bit touristy, attracting people from far and wide. 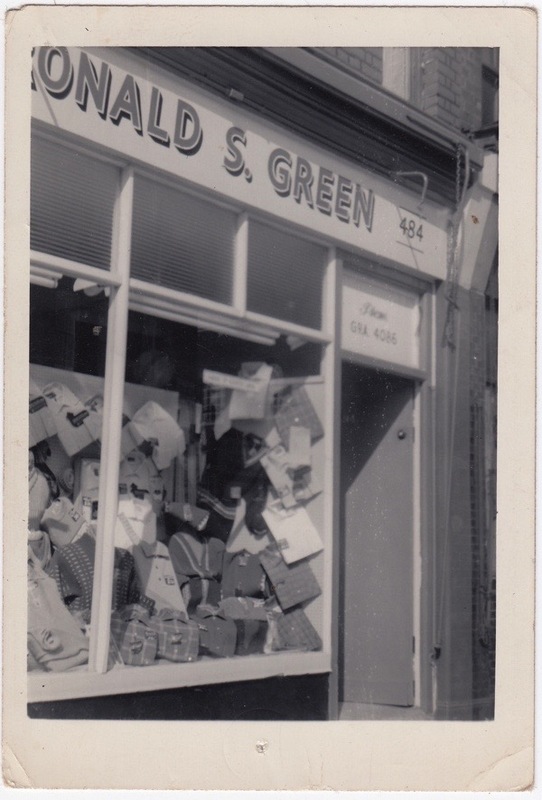 The Gentle Author - My parents went to Petticoat Lane on their honeymoon in 1958. Robert Green – Imagine someone saying that now! “I’m taking you to Petticoat Lane for your honeymoon,” I do not think it would go down too well. Incredible when you think how times have changed. Down here in Club Row, it was mostly pets and birds in particular. If you look at any photos from the fifties and sixties or earlier, nine out of every ten people would be men. Very few women used to come down, it was always known as a man’s market mostly because of the association with birds, which were an exclusively masculine interest in those days. Originally we had one pitch from which we traded all through the forties and fifties. 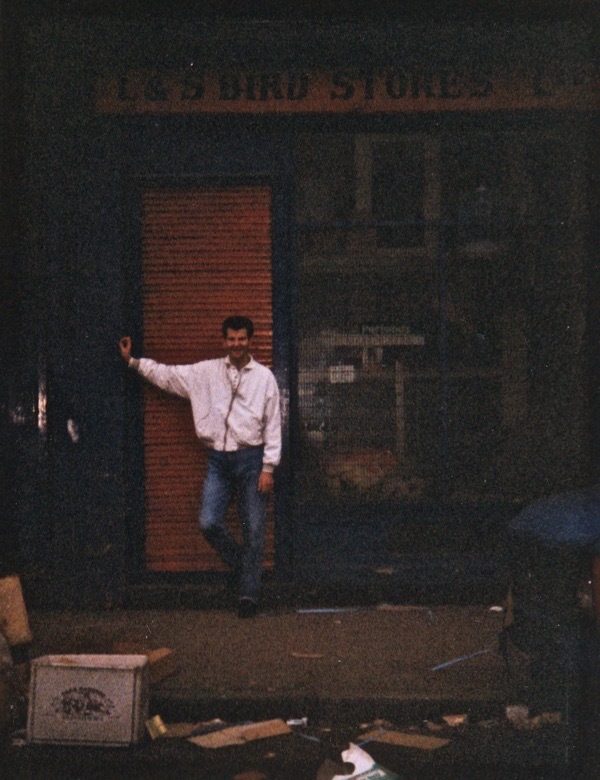 By the late fifties, my father had made a little bit of money in the market so he managed to acquire the shop in Upton Park which acted as a base. The Gentle Author - Your grandfather was dealing in bird seed, why do you think your father switched to shirts? 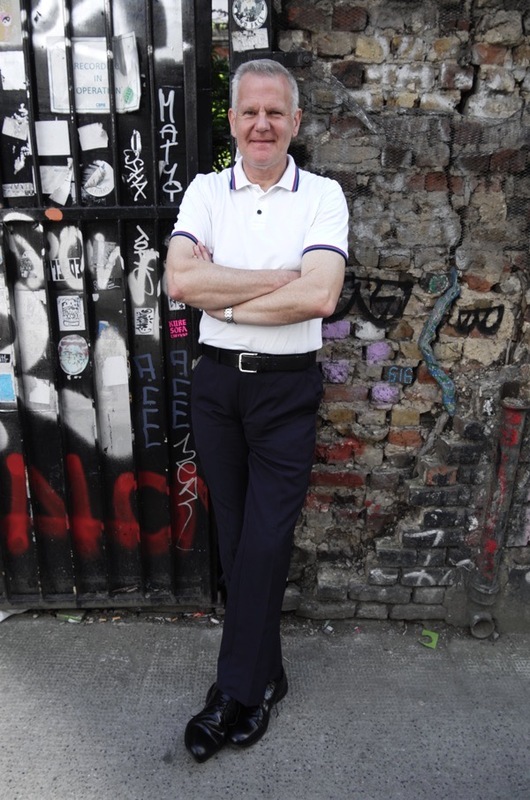 Robert Green – When my father left school, he started working in a pawnbrokers at Canning Town and they used to deal in a certain amount of clothing. Then he got a job in a department store near Canning Town called ‘Stabbings’ and he worked in menswear. Then he transferred to another one at Upton Park – ‘Woodmanses,’ which had a menswear department too. Finally, he ended up working in a menswear shop next to the Odeon at Upton Park. It was called ‘Finkles’ and my dad worked for the Jewish man that ran it for ten years, so he built up a background in clothing. 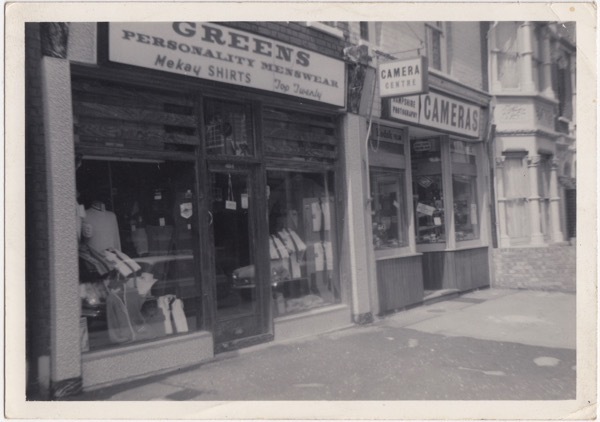 When he eventually got his own shop in Green St, it took off because he became an agency for a lot of big firms – Fred Perry, ​R​aelbrooks - all the top names of the time. That enabled him to have a fantastic trade because a lot of shops could not even get those brands, so having them in a market put him streets ahead of everybody else. By the sixties, we had two stalls in the market. We had two vans and two drivers – on an average Sunday we had about six people working on our stalls. The Gentle Author – Was a lot of this clothing manufactured locally? Robert Green - In those days, it was all manufactured in England and a lot of them were London-based firms. ​R​aelbrooks was in Walthamstow and Fred Perry’s factory was up in Tottenham. Double Two was a Wakefield shirt company, they had two factories – Barnsley and Cleckheaton – up in Yorkshire. We used to go there two or three times a year, once we could buy a lot of stock. In the market, it used to be absolutely phenomenal. During the sixties, when I was still at school, I was down here every Sunday and I spent all morning wandering round the market. Then I came back and spent a few hours sitting under the stall in a cardboard car, eating sweets. The Gentle Author – What were your first impressions of the market? Robert Green - I thought it was incredibly exciting, I could not wait to get down here every Sunday even though I was only about ten years old. You could find stalls for everything under the sun. In those days, every Sunday was like Wembley at Cup Final – you had to push your way through the crowd, shoulder to shoulder. We used to have them about five or six deep round our stall. If you walked away from the stall, you could not get back, it was be so crowded. It was an absolute magnet. I have seen people fighting over a yard of space because they did not have enough room for their stall. It was so crowded you would not believe it. Now you could drive a bus through here and it would not touch anything. There were so many characters too. Going to the market in the fifties and sixties was like street theatre. Even if you did not want to buy anything, you could spend the morning being entertained because all the stalls had characters who had their own routines. Beside our pitch we had two brothers – they used to sell crockery, tea sets and china. They started off by spreading out this massive tea service, cups on top, saucers, and they would have the whole thing piled up with about fifty pieces of china. Eventually, they would throw the whole lot up in the air, crash it down onto the stall and shout out a price. I must have seen them do that thousands and thousands of times, but I never once saw them break anything. It was a real skill, there was an art to it. As a boy, I used to be fascinated, standing there for ages watching them over and over again, waiting for them to drop something, but they never did. There was an elderly man with his daughter who stood one stall away from us, they sold that white paste you clean cookers with, which gets the grease off and grime. It was his own concoction because in those days there was no real consumer legislation. I remember his daughter. She was probably in her thirties and she looked like a film star, always very glamorous – the most unlikely person you could imagine on a market stall. She had bright blonde hair, always wore bright red lipstick and she dressed very smart. They took it in turns to demonstrate and he would get these old grimy cooker pieces out, spread this stuff on, then give you the spiel and, after a few minutes, magically wipe all the dirt off and it would be beautiful and clean. Then, to demonstrate how safe it was, he would put his finger in the tin, scoop a dollop out and clean his teeth with it, to show that – no matter what you did – it was not going to do you any harm. I used to stand there for hours and hours watching. Almost every other stall had someone doing this type of thing. It was a day out. On the other hand, I have mixed feelings about the animal market because I am a passionate supporter of animal welfare. There were genuine people but I would not dispute there were also a lot of unscrupulous people who attached themselves to it as well. You did get a lot of things going on that should not have been allowed and, during the eighties, the animal rights campaigners began arriving each week, so eventually it got outlawed and you could no longer trade in animals. It did have a massive effect on the market because probably a third of the people who used to go down there only went for the animals, so that was a real turning point. In one way, I am glad the market changed but there were a lot of innocent victims who got pushed out at the same time. Palmers’ pet shop, for example, established over a hundred years. I knew Mr Palmer well, his father had been there since the turn of the nineteenth century. They spent all week bagging up birdseed and, on Sunday, the whole lot would go out in one morning. There used to be a queue of people outside right up until they closed at two o’clock in the afternoon. In the late eighties, Mr. Palmer retired and a West Indian who was running the place for him took over the business until redevelopment forced him out. I still keep in touch with him, he is back in Trinidad now but he phones up occasionally. 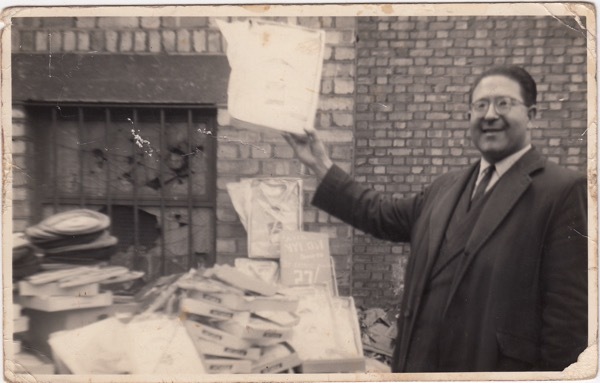 The Gentle Author - Do you remember the Bishopsgate goods yard fire? There were twice as many people there as normal, because you had all the usual market crowd plus a lot of others who had watched the news and come to see what had happened. By around ten o’clock, the fire was over apart from trails of smoke here and there, so the fire brigade decided to clear the hoses and the police let us down Sclater St. In those days, the market inspectors were very strict. They came round at one o’clock and that was the end of trading. They all looked like Blakey out of ‘On the Buses,’ they had long trenchcoats and peaked caps and they would come round with a clipboard, very stern. “One o’clock, stop trading, stop serving, start packing up!” So at ten o’clock we only had three hours to trade, yet that turned out to be one of the busiest Sundays we ever had. I remember my father telling me we were so busy that he had to send one of the drivers back in the van to the shop to get more stock. Yet, although it was a disaster that turned out to be an amazing success from a business point of view, I cannot forget the people who lost their lives in that fire – a customs officer and a railway worker. That fire transformed the place and it never really got back to normal. Thousands and thousands of people used to be in and out of the goods yard all the time but, after the fire, it made the area desolate during the week. From Monday to Saturday, you would see nobody you knew. Eventually they pulled the goods yard down but in the meantime the market had got to the stage where, over thirty years after the war, it was the same as it had been since the bombs dropped. I remember there were old burnt out cars abandoned on the bomb site and, where the cellars once were and they had levelled it off, the ground dipped down. I used to play and lark about over there. 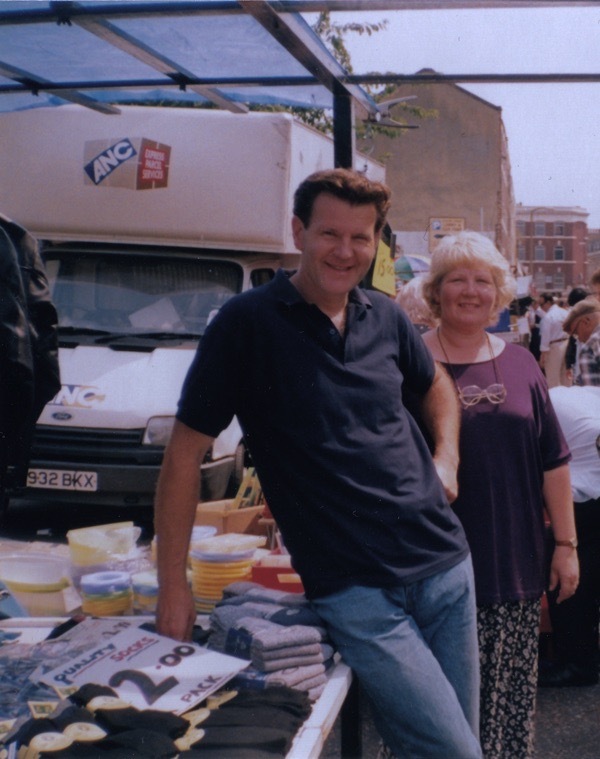 All through the seventies, the bomb site was full of stalls, there was literally hundreds and hundreds of stalls, and that created a massive uplift in the market because it had almost gone to four times its size. It all merged into one and we probably did more trade in the seventies than during the fifties and sixties. The Gentle Author - By this point, you were running the family pitches? Robert Green – I was coming up to leaving school and my father did not even ask me, he just assumed that I would start working for him, so in 1971 when I left at the end of the summer term, he said, “You have a couple of weeks off and then you can start working for me.” So I had two weeks’ holiday – I did not go anywhere, I was just loafing about – and then I started working in the shop and, from then on, I was in the market every Sunday serving on the stalls with my sister Pat. 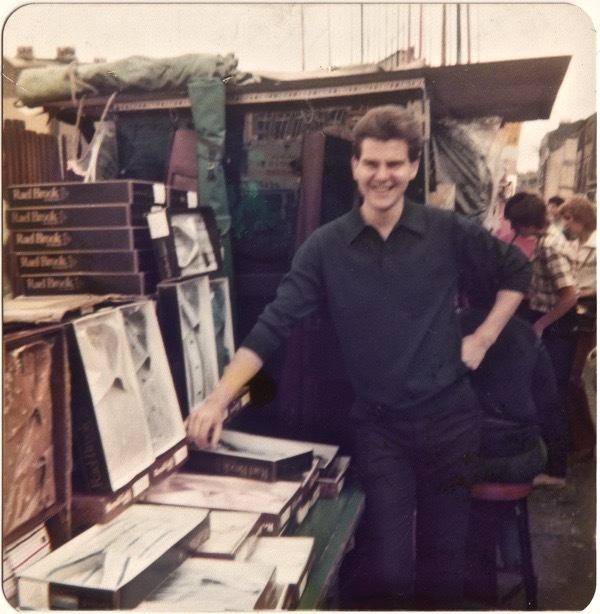 I was only a teenager but I had new ideas and, after a year or two, when I had found my ground, I started to put more and more into the business and we began to build it up, so by the mid-seventies we were doing more trade than ever. We drove down here with two big vanloads and came back with virtually nothing. We used to have a little crowd of people waiting for us when we arrived at the stall. People used to come up and say, “Give us one of them in white, blue, cream, in this size,” and that was it, a dozen at a time. In the late seventies, there was a period of rapid inflation. We were putting up prices four or five times a year and that was reflected in lower sales, and we got into a vicious spiral. Then the animal market went and there was a 50% drop in our business. By then the trading laws had changed, so the market was no longer the place to be on a Sunday morning because the high streets shops were open too and there were car boot sales opening all over the place. We kept going because it is what we do but we got rid of one of the pitches. We were back to where started yet, although the trade was not there and we were not making money any more, I do not ever remember my father even vaguely suggesting that we might not be there. Whether the trade was there or not, he still had the same attitude. Since 1971, I have only missed seven Sundays. Six of those were in 1976 when I broke my leg and could not walk, and the other one I had to miss because the licence was being changed into my name and the council stopped me trading for a week. I ignored it and went down there but, the following week, they came up and said, “If you’re here next week, we’re going to prosecute you because you’re not allowed to be here.” I still went down there actually but I was not trading. I walked him back and got him into the car and then, after almost seventy years of being down here every Sunday, he left Sclater St for the last time and two weeks after that he was dead, just after Christmas. I thought to myself, “What he would want me to do? He would want me to prove myself, prove my own worth, that I could do just as much as he did.” So I threw myself into the work wholeheartedly. I was working twenty hours a day in the shop. I was there until one o’clock in the morning unpacking stock. I was out all the time going round wholesalers and suppliers. For a year or two it paid off. We ended up doing as much trade as we used to do years ago but then, because I was successful at it, I found did not want to do it anymore. I had proved that I could, I had been as successful as he had. I had fought against adversity but I did not see any point in carrying on and I started to get a few health problems. We were getting a lot of problems in the shop – burglaries and robberies all the time – things had totally transformed in Upton Park. We had to keep the door locked during the day even though the shop was open. So it was a choice – either the market or the shop. There was no way I could lose the market, so I discussed it with my sister and we decided to sell the shop. Since fifty, I have gone into sort of semi-retirement and at the end of this year I will be sixty. I do not think I would be here now if I had not taken my doctor’s advice because I could not have carried on like that. After I sold my father’s shop, I was wracked with guilt for three or four years but I am sure I made the right choice. We have not made any money in the market for the last four or five years and most weeks it costs me money to be here, but I do not care. I am coming down here because it is where we have always been, it is tradition. I know everybody down here – it is like a social club more than anything. To a lot of people, the market is like a family, they feel comfortable down here. You get those who are on the fringe of society, they do not really fit in elsewhere, these people seem to levitate towards it because they feel comfortable here. These days you hear so much about community spirit but they do not know what they are talking about. Having a shiny block of flats is not generating community spirit, it is completely missing the point. What is going on down here in the market and what has happened in the past, that really is a community spirit. People feel comfortable, they feel that they are part of something and when they are not here they feel as if they are on the outside looking in at everybody else but they love it in the market because they really feel this is where they belong, you know. I really enjoyed reading this story about these wonderful,hardworking characters, thank you! Me, too! Seldom post comment, but glued to Each & Every real-life narrative you write, GA. The bustle and vibrancy of Club Row was a magnet for our family when we first hit London in the early Sixties. I’m in Cannes in France at the moment – and because I read this post this morning, I had my breakfast at one of the market cafes that line the edges of the fruit & veg market here. It was sunny and lovely and there were loads of interesting looking people and dogs of all kinds. Benefitting from the after-effects of your story! While I accept that many of those working at Club Row may have been concerned with animal welfare nevertheless the place was also a focus for vivisectors. In the days before animals were specifically bred to be dissected and experimented upon strays were often rounded up and sold to laboratories. In addition at the end of the Sunday market unsold dogs were often disposed of in this way. Robert is amazing. Thanks for bringing us his story with fantastic photographs from the past. hello Robert, have much enjoyed reading about you and learning more about your story. It’s told with the same sort of feeling and passion that you put into your comments which I always read avidly. May your years from 60 on be as full of life as they’ve always been, however they unfold. You are a real original. Great story. I remember the guy with the tea service. Thanks and all the best. A very interesting post about market life which was very much a way of life as opposed to a nine to five job. Robert Green has a heritage to be valoued and to be proud of l wish you good health and good luck for the future. fascinating! So vivid, south of the River it was East Street Market and shoulder to shoulder just as Robert describes it. I took the time to read this and it is a great story. I am going to visit the lane soon and will look out for this guy. So sorry to hear about your accident,hope your better soon.